This listing is for ONE Bag of circulated $100 Face Value 90% Silver Walking Liberty Half Dollars. 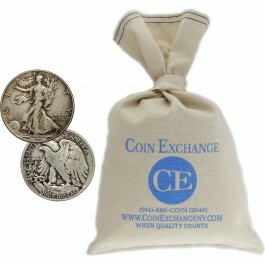 Each bag will contain 200 pieces in average circulated condition with full readable dates. No dates or mint marks are guaranteed. Each $100 face value bag will come with our own branded canvas bag. The photos provided may not be the exact bag you receive, however it represents the same product.